Wayman Oil- Quality propane service since 1976. Wayman Oil Co. – Quality propane service since 1976. We provide propane services for residential, commercial and agricultural customers. In addition to delivering propane, we provide leak and pressure checks. We focus on propane delivery and keeping the price of propane affordable for our customers. We’re the only propane provider in the area with a propane tank mover that can be used to avoid damage that large trucks can cause to your yard. We can also provide line trenching as part of our system installation. We serve customers in Butler, Sumner, Sedgwick and North West Cowley Counties and can be reached anytime, day or night. When you need energy, Wayman Oil offers a full range of propane services and technical expertise on propane applications. We are a member of the National Propane Gas Association, which is the national trade association for the U.S. propane/LP-gas industry. Wayman Oil is also a member of the Propane Marketers Association of Kansas, the Mulvane Chamber of Commerce, Green Biz Wichita, the Wichita Chamber of Commerce and the National Federation of Independent Business. 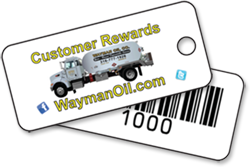 To show our appreciation for all of our customers, Wayman Oil is starting a new Customer Rewards program. To join, sign up for your rewards card the next time you stop by – you’ll get your card right away. Bring it with you each time you get your gas grill cylinder filled. After 5 fills, the 6th one is FREE! Plus, you’ll be entered for a chance to win a new gas grill if you sign up now – come see us and get your free rewards card today! 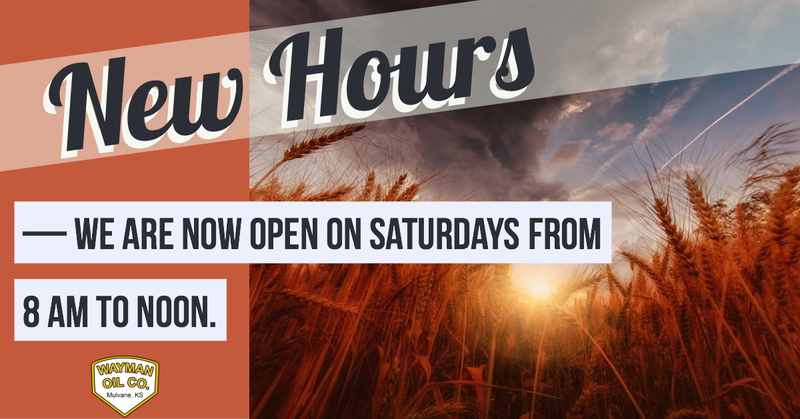 Starting September 8th, we will be open again on Saturdays! 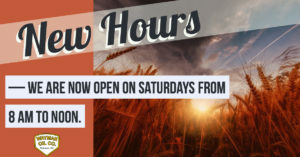 Our Saturday hours are 8 AM to 12 PM.